A Quick Summary of the Jack the Ripper Story. In this article we are just going to take a quick look at the Jack the Ripper saga, detailing some of the people who have, over the years, found themselves connected with the story, be it as victims, suspects, police officers, or whose names simply come up in the press reporting of the case. We are also going to take a brief look at the main events concerning the case that is, without doubt, history’s greatest, and most baffling, whodunnit. As far as the crimes go, it is generally agreed – though by no means certain – that the Jack the Ripper murders took place over a 2 -3 month period in 1888. However, the Whitechapel Murders, the generic name under which the crimes now known as the Jack the Ripper murders fall, cover a longer time frame that runs from April 1888 to February 1891. In April 1888, Emma Smith was attacked by a gang of youths at the junction of Wentworth Street and Brick Lane. Although Emma survived the initial attack she later died from her injuries and, as a result, her’s is the first name that appears on the generic police file of the Whitechapel Murders, although she is not believed to have been a victim of the killer who became known as Jack the Ripper. In early August 1888, Martha Tabram was murdered in George Yard. Her injuries were severe and, to this day, there is a great deal of debate as to whether or not she was a Jack the Ripper victim. One thing though is certain. The murder of Martha Tabram caused considerable disquiet, not just in the district where it occurred but throughout the whole of London, and people began to fear that something decidedly out of the ordinary was occurring in the East End of London. These fears appeared to have been confirmed when, before the end of August 1888, the mutilated remains of another woman were found in Buck’s Row, just a short distance away from the location where Martha Tabram had been slain. Durward Street, Formerly Buck’s Row. 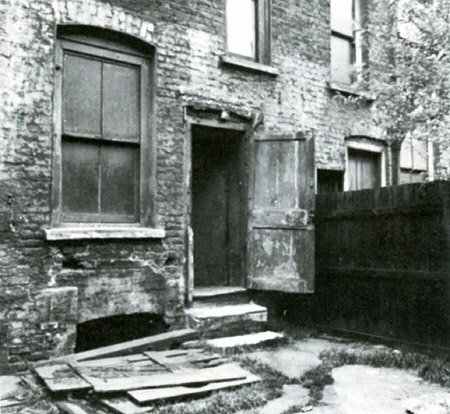 This killing, the first murder that is generally attributed to the monster who would enter history as Jack the Ripper was, that of Mary Nichols, and her mutilated body was found in Buck’s Row, a dark thoroughfare located just behind the busy Whitechapel Road, at 3.40am on August 31st 1888. No sooner had the people of the East End come to terms with the horror of the murder of Mary Nichols, than, a week later, the unknown miscreant struck again and murdered Annie Chapman, in the backyard of 29 Hanbury Street in Spitalfields on the 8th September 1888. Interestingly, as far as the murder of Annie Chapman was concerned, several witnesses came forward to say that they may have seen Annie in the company of her murderer. Chief amongst these was Mrs Elizabeth Long, who had seen a man and woman chatting in front of 29 Hanbury Street (the house in the backyard of which her body was later found) at around 5.30am on 8th September 1888. Although Mrs Long didn’t see the man’s face, she did overhear him speak to the woman he was with and, from the sound of his voice, she deduced that he was a foreigner. It was during this period that one of the earliest suspects was named as being a sinister character by the name of Leather Apron who was, apparently, attempting to extort money from the prostitutes of Whitechapel. According to Sergeant William Thick (sometimes spelt Thicke), it was well known in the area that “Leather Apron” was the nickname given to a local man by the name of John Pizer. Unfortunately, when Pizer was finally tracked down, shortly after the murder of Annie Chapman, he was able to provide cast-iron alibis for the murders he was suspected of having committed and was quickly ruled out of having any involvement in the crimes. Meanwhile, the detective department of the Metropolitan Police was left leaderless when, the newly appointed Assistant Commissioner Robert Anderson (later Sir Robert Anderson), was ordered to take a recuperative break by his doctor and he duly decamped to Switzerland around the time of Annie Chapman’s murder. With Anderson out of the way Chief Inspector Donald Sutherland Swanson was put in overall charge of assessing every piece of information that came in about the case. As the officer with the “big picture” with regards the Whitechapel Murders he probably knew more about the case than any other officer and had a good idea of the major suspects. He would later write that the police had considered Aaron Kosminski to be the likeliest suspect for the mantle of Jack the Ripper. An increased police presence on the streets of Spitalfields and Whitechapel in the wake of the murder of Annie Chapman appears to have deterred the murderer and the last three weeks of September passed without any further atrocities. But then, on 30th September 1888, the killer returned and murdered two victims in the space of an hour. 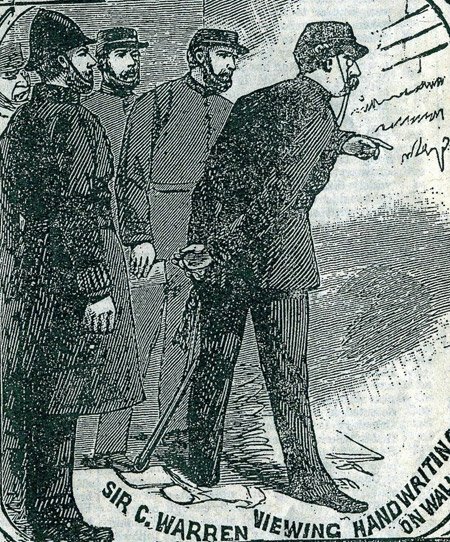 The first victim, on what became known as the “night of the double event” was Elizabeth Stride, whose body was found in Dutfields Yard, off Berner Street, at 1am. 45 minutes later. PC Watkins found the horrifically mutilated body of Catherine Eddowes in Mitre Square, on the eastern fringe of the City of London. A little later, at 2.55am, PC Long found a bloodstained portion of Catherine’s apron in a doorway on nearby Goulston Street. The fact that the killer had used it to wipe the blood from his hands and knife suggests that he escaped eastwards from Mitre Square and, therefore, suggests that he was a local man who probably had lodgings somewhere in the vicinity. PC Long also discovered a message scrawled in chalk on the brickwork of the doorway. It read “The Juwes are the men that will not be blamed for nothing, ” or words to that effect. The City Police, who were investigating the murder of Catherine Eddowes, which had taken place in their jurisdiction, believed the graffito to be an important clue and wished to photograph it when it became light enough to do so. However, they were overruled by the Metropolitan Police Commissioner Sir Charles Warren, who arrived on the scene at around 5.30am and ordered that the message be erased, for fear it might lead to ant-Jewish unrest in the immediate neighbourhood. In early October the police released a letter which had been sent to the head of a London news agency towards the end of September. 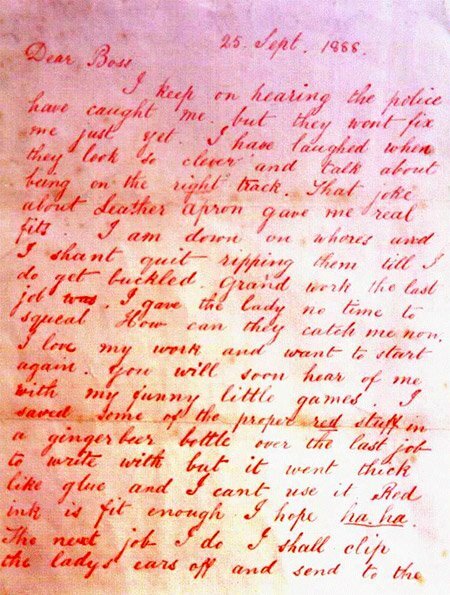 The Dear Boss letter from Jack the Ripper. The fact that two further murders had taken place within 24 hours of the news agency passing the letter to the police meant that the police had to take it seriously, and accordingly they made the letter public in early October. What the police hadn’t anticipated was that the signature on the letter, Jack the Ripper, would catch the public imagination and would lead to a veritable tidal wave of similar correspondence that came close to overwhelming the beleaguered police investigation. Most of these letters were obvious hoaxes. But one of them has been the subject of considerable debate, and opinion is still divided as to whether it did come from the murderer. The fact that Catherine Eddowes murderer had removed and gone off with her left kidney convinced, and still convinces, some people that this letter was in fact genuine, albeit Dr Openshaw, the curator of the London Hospital’s Pathology Museum, was emphatic that, although he thought it was human, it was impossible to identify it as having being the kidney of a particular person. The general consensus today is that the kidney was a prank, possibly orchestrated by a medical student who, like so many citizens, found the allure of becoming involved in the Jack the Ripper pantomime difficult to resist. As far as the murderer was concerned, the increased police presence in the area that followed the night of the “double event” made it too risky to go out in search of prey and, as a consequence, the whole of October, together with the first week in November, passed with no further murders. Indeed, by the 8th November, the area as a whole had begun to relax and a semblance of normality was returning to the night time streets. JACK THE RIPPER’S FINAL MURDER? But then, at 10.45am on 9th November 1888, John McCarthy, the owner of several rental properties in Dorset Street, Spitlafields, sent his assistant, Thomas Bowyer, round to 13 Miller’s Court to collect the 29 shillings in rent arrears that the tenant Mary Kelly owed him. When he got no reply to his knock on the door, Bowyer went round to a broken window pane and peered into the room. The sight that he saw would haunt him for the remainder of his days. The skinned to the bone remains of Mary Kelly’s cadaver lay on the bed, whilst lumps of bloody flesh had been piled onto the bedside table. Soon Inspectors Walter Dew and Walter Beck were at the scene and, not long after them, Inspector Frederick Abberline, the officer in charge of the on the ground investigation, arrived. But there appears to have been some confusion over whether or not they should enter the room as Sir Charles Warren had instructed that, in the event of any further murders, no-one must approach the scene until blood hounds could be brought and put on the trail. It was several hours before word arrived that no bloodhounds would be coming and the police finally entered the tiny room in Miller’s Court. Although Mary Kelly is, generally considered, to have been the last victim of “Jack the Ripper”, the Whitechapel Murders continued until 1891 when Frances Coles, murdered on 13th February. Interestingly, in the wake of the slaying of Frances Coles, the police did arrest a man by the name of James Sadler, whom they considered a promising suspect – not just for the Coles murder, but also for the spate of killings now known as the Jack the Ripper murders. However, the case against Saddler collapsed and, with it, the investigation into the Whitechapel Murders was gradually wound down. Although the crimes occurred over 125 years ago, interest them seems to increase with every year that passes and numerous suspects have found their names linked to the World’s most infamous murder spree and have found themselves in the frame for the mantle of having been Jack the Ripper. Which One Was The Ripper? Some, such as Prince Albert Edward Victor and Lewis Carroll are ridiculous. Some, such as Sir William Gull, James Maybrick, George Hutchinson, Walter Sickert and John Netley, crop up time and time again assuming varied roles in the killing spree. Others, such as Montague John Druitt, Dr Francis Tumblety, Aaron Kosminski, Thomas Cutbush, and Frederick Deeming, are certainly worth paying close attention to and might well reward the intrepid investigator who is able to fit that final piece into the puzzle, with the satisfaction of being the person who caught Jack the Ripper. Have you booked your place on our tour yet?